The third 2 lucky winners of “Caltex Star Drive – Car and Bike Chase” awarded. | Welcome to Chevron Lubricant Lanka PLC. » News » The third 2 lucky winners of “Caltex Star Drive – Car and Bike Chase” awarded. The third 2 lucky winners of “Caltex Star Drive – Car and Bike Chase” awarded. 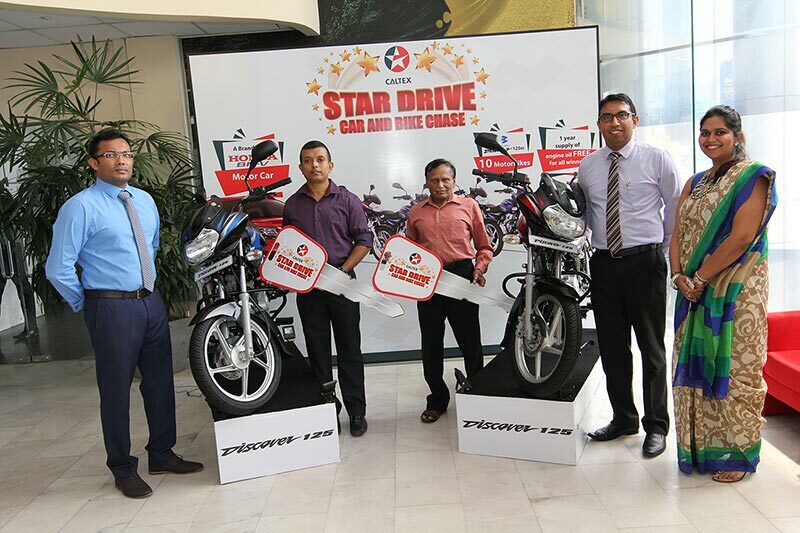 Photo caption : The winners of the third round of “Caltex Star Drive – Car & Bike Chase” with their awards. On the 13th of June 2017, the third two winners of Caltex Star Drive – Car and Bike Chase” received their brand-new Bajaj Discover 125cc motorcycles plus a year’s worth of free engine oil at an event held at the Chevron House in Colombo 3. The lucky winners of the third round are T.G. Jayanandana from Kundasale and W.K.D Wijesiri from Gampaha. Caltex Star Drive – Car and Bike Chase” offers the consumers an opportunity to win a brand-new Honda BR-V 7-seater Compact SUV as the grand prize or one of ten brand new Bajaj Discover 125cc motorcycles along with a year’s worth of engine oil. Four lucky winners have won Bajaj Discover motorcycles and a year’s supply of engine oil during the monthly draws held in April and May. Two more randomly selected winners will stand the chance of winning the motorcycles and the annual supply of engine oil at the draw to be held in July. The final two motorcycles and the Honda BR-V Compact SUV will be awarded at a Grand draw which will be held in September 2017. To stand a chance of winning these valuable prizes, the consumers simply need to reveal the secret code by scratching the panel on the reverse of the card attached to the promotional pack and SMS it to 2343 by typing CALTEX SECRET CODE NIC NUMBER.